Matt and Marja have recently opened a store front in downtown Pella, IA which will make it a whole lot easier for them to be the First Responder when that chocolate emergency hits! Marja has grown up in the family business, and Matt is quickly learning all the secrets from his in-laws, Chuck and Jill Van Veen. When Chuck was working in the farm equipment business, he gave samples of his mother’s peanut brittle to some of his customers. The candy became so popular that Chuck’s mother finally told him that she couldn’t keep up and he would have to start making his own! Fortunately, Chuck took his mother’s advice. 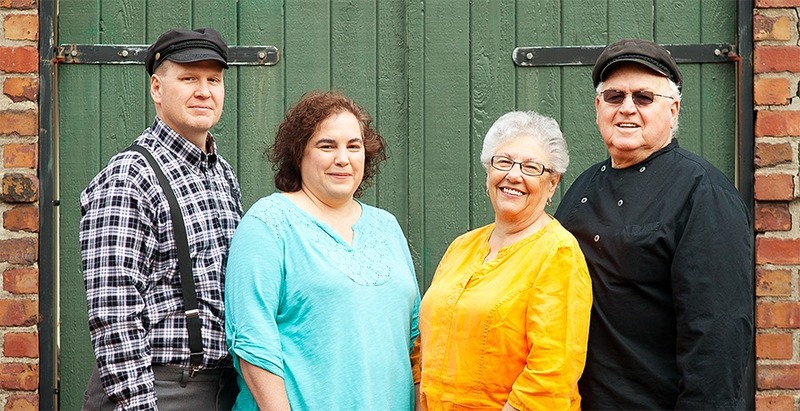 The Van Veen family secret recipes were passed on, and from that humble beginning, a new business and many more great treats were eventually born. In 1997 Chuck began selling his peanut brittle at craft shows. He opened his first store front at 621 Franklin Street in May of 2002, just in time to be mobbed by Pella’s Tulip Time guests! His wife Jill could be found assisting him, and his mother, whose innocent suggestions started everything, helped out on occasion as well. Today, the new store front is found in between the Pella Opera House and The Wijn House. A perfect location to get all your Dutch treats in one visit to downtown Pella. Van Veen Chocolate customers love Grandma’s peanut brittle, hand-wrapped caramels, pecan stukjes, meltaways, and Chuck’s special butter toffee. The chocolates are all made fresh daily. Stop by for a sample. This is great if you are not sure what your favorites are yet. You will seldom see anyone walk out of Van Veen Chocolates without a smile on their face and goodies in their hands. Make sure to stop by when you are in Pella!